Onam festival is the best time to be in God's very own country. Take in the scent and tastes, delight the sights and voice of the festival as a whole universe of festivities open to clasp you throughout Onam Festival in Kerala. The atmosphere colored with the same joy which insides the people's hearts. 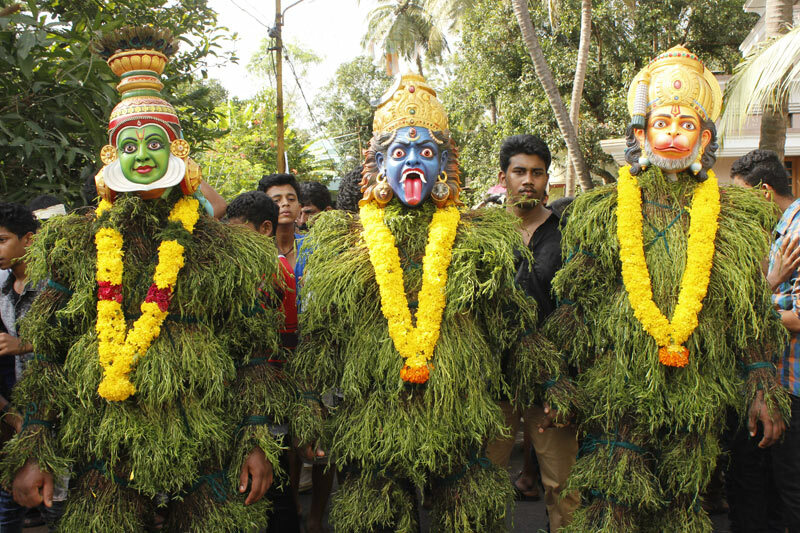 It's a time for the celebrations, games, and ritual functions in Kerala. Onam brings the very best of Kerala tradition and culture which celebrated for the ten days. Elaborately decorated Pookalam, angelic Onasadya, thrilling Snake Boat Race and exotic Kaikottikali dancing are a few of the most impressive attractions of Onam. As per the legends Mahabali – the mytholical King of Kerala donated his land to Vamana – an incarnation of Vishnu and later permitted to visit his kingdom once in a year to see his people, hence to welcome their king Keralite celebrate this day as Onam Festival. On the first day of the tour, after your arrival at the Cochin International Airport, you will get a warm welcome with local Kerala tradition that is enough to say how beautiful this tour is going to happen. We will go for hotel check-in and then let you know every brief detail about the remaining days of the tour. You can rest there to be the refreshed for the next days of the tour. September 02, the very first day of Onam festival (the ten days festival) starts with the Athachamayam festival – the celebration of the victory of the Kochi King. 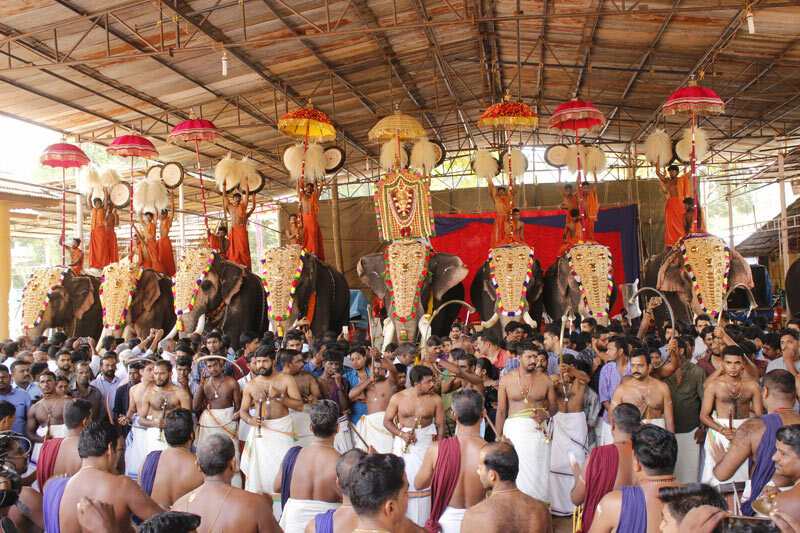 Athachamayam marks as the beginning of the Onam festival. To witness Athachamayam, we will lead to Thripunithura (Hardly ten kms away from Cochin) after taking the early breakfast. 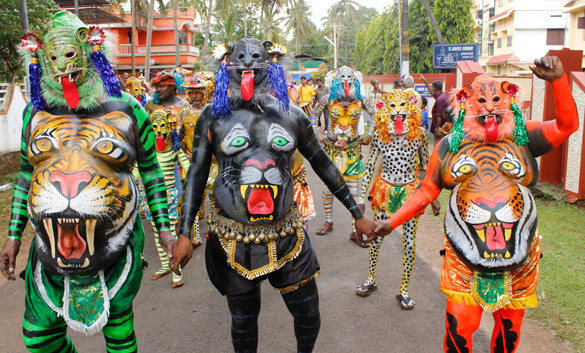 Athachamayam is such a festival which itself has replete all the folk art forms and dance forms of Kerala. The major attraction of the festival is the well-crafted makeup of the artists, which is quite adorable to watch. After lunch, you can thrill yourself with a boat race at Champakara village. Later, we will move forward to a local Church to enjoy the Flower carpet competition. In the evening, we will return to the hotel to relax. 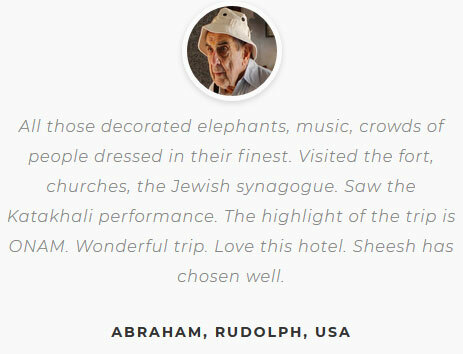 After enjoying the mouthwatering tasty breakfast at the hotel, we will check out and visit Santa Cruz Cathedral and Jewish Synagogue. Santa Cruz Cathedral is an architectural beauty and magnificence of Kerala. It is a church in Cochin fort and the centre of holy historical concernment, which bestowed with artistical pomp and the colours of the ancient style. You will fall in love with unique design and beauty of the church. Jewish Synagogue is another attractive place to must visit in Cochin fort. Jewish synagogue is the symbol of care and worship of Jewish community which is an elegant masterpiece of construction. Later, we will move forward to Munnar –Kashmir of South. En-route witness the lots of waterfalls. After the arrival in Munnar, check-in to the resort surrounded by the natural beauty. 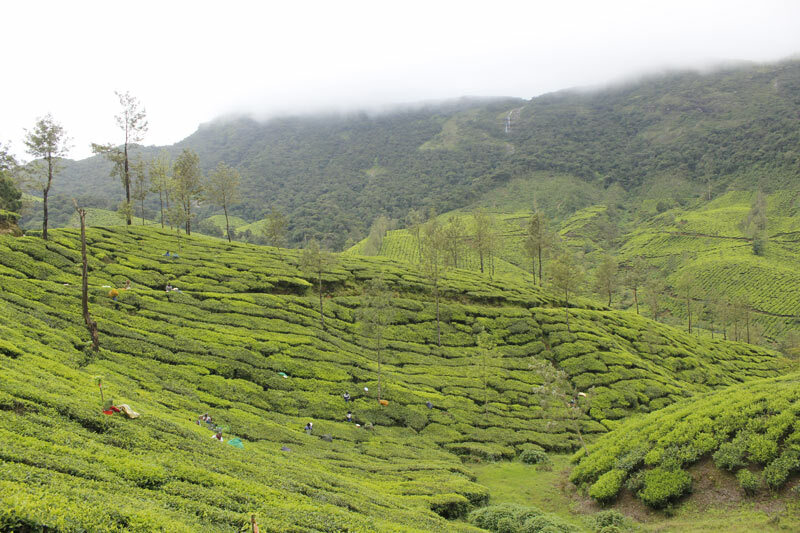 After the breakfast, we will unearth Munnar – the most scenic hill station of South India nestled in tea estates. Munnar offers tea plantations, tea museum, Mattupetty dam, Anamudi peak, and many other mindblowing places to retreat natural beauty to your eyes. The refreshing gust, all hills covered with haze and mountains with green tea plantations, amazing slopes, catchy eye canyons, and sludge streets between the green tea gardens along with some daring ride throughout the entire sharp turns will enthral you. 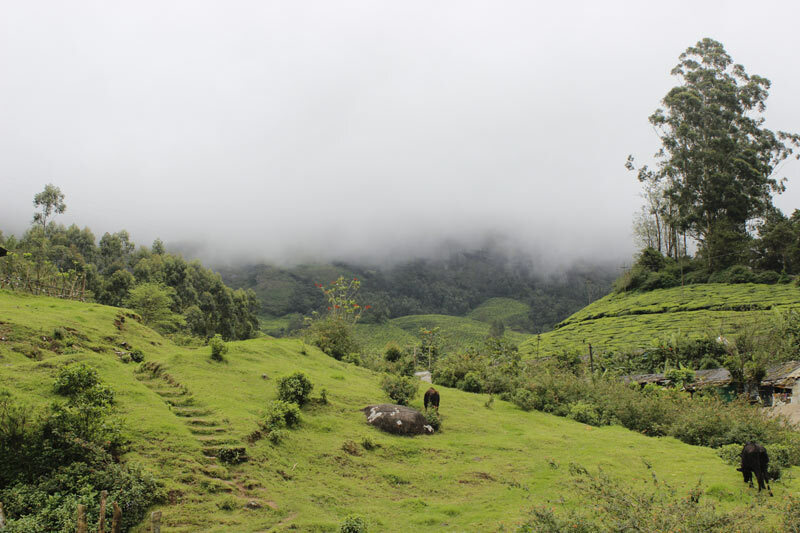 Extend over the Western Ghats, Munnar has lots of stunning landscapes and scenery excellent for you. After witnessing the beauty of Munnar, today we will drive to Madurai – the temple town of the Tamil Nadu. The other name of Madurai is “Thoonga Nagaram”, the city which never sleeps, chiefly due to its rousing nightlife. After reaching to Madurai, we will first check in to the hotel, and later we will visit the most famous Meenakshi temple. 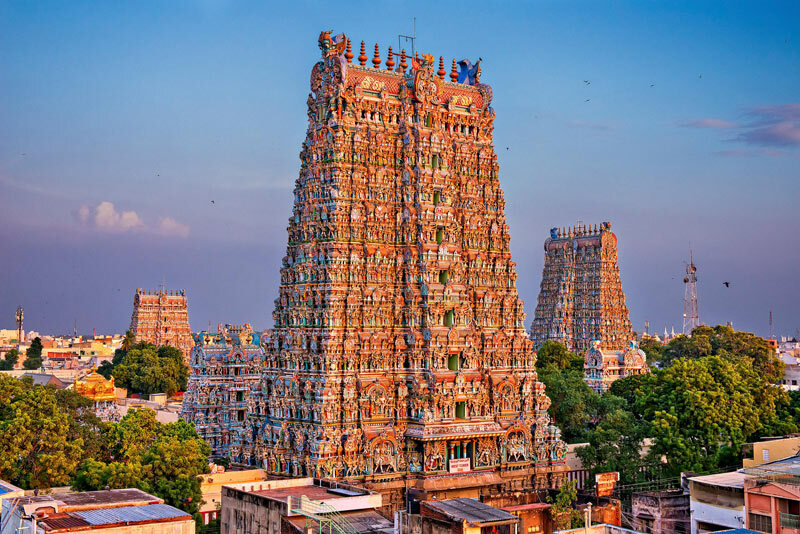 Meenakshi Temple located on the banks of Vaigai River is one of the most famous temples of India. Tirumalai Palace is another emblem of imposing inwrought with tall white balusters. We will also explore the local markets in Madurai. 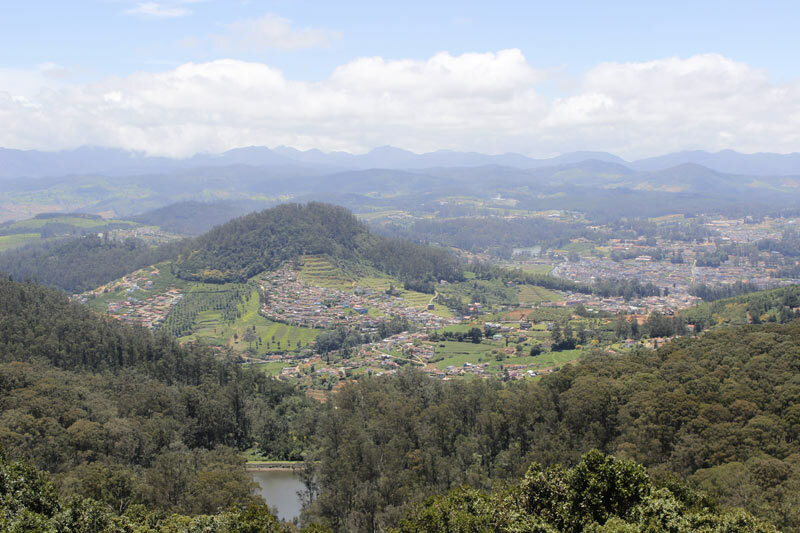 Travel further to the hill stations of Coonoor, unfolding the village life, wildlife, and tea plantations on the way to Coonoor. Upon the arrival to Coonoor, take some rest at the hotel. Later, we will visit Lamb’s Rock and other popular destinations of Coonoor. The special traveler enchantments in Coonoor are Catherine Falls, Hidden Canyons, Dolphin’s Nose Point, Sim’s park, and the Lamb’s rock. Lamb’s Rock is plethora yards over sea level. An individual could get to the very top of Lamb’s rock after having a thrilling conclusion, also indeed will scrutinize a large extent of the superlative scenery. After breakfast, check out from Coonoor and move to Ooty by special toy train. The train ride will be a scenic journey passing through the Nilgiri mountains offering the spectacular views. 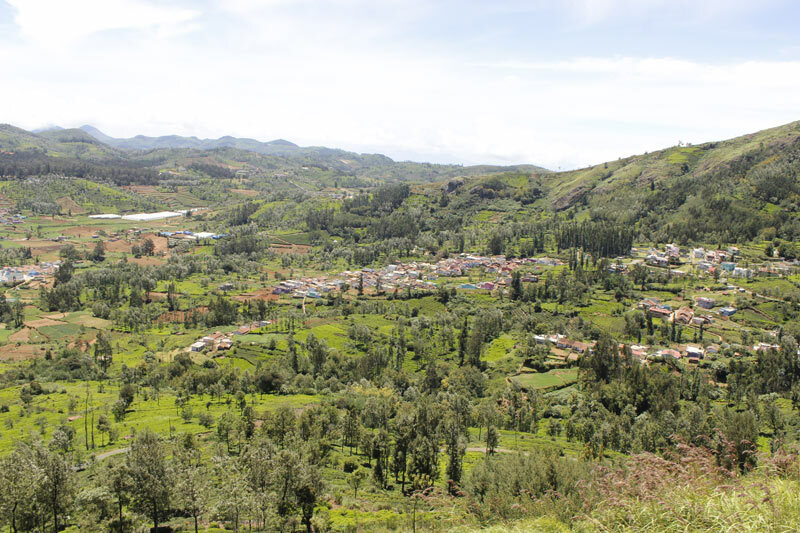 Ooty also named as the “Queen Of The Hills” because of its rich surrounding. The hill station offers itself spellbinding panorama, astounding tea gardens, and eucalyptus trees along with stunning mountains surroundings. From the breathtaking tour of Ooty, drive further to Wayanad in Kerala. 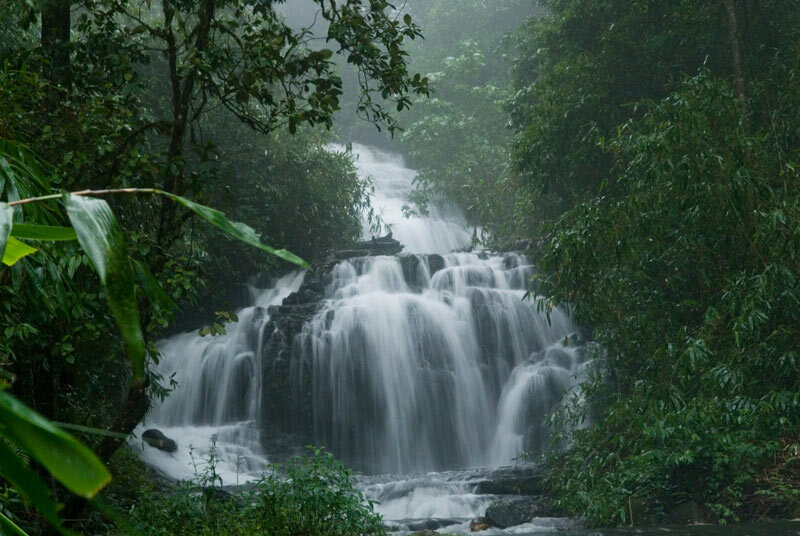 Upon arrival, enjoy the serinity of Wayanad. After exploring the natural beauty, we will move today to the village life of the two main tribes (Paniyas And Kurchiyas) of the Wayanad. Thatched roof, mud, bamboo and brick houses are commonly seen that you are going to see here. In India, each tribe has their untold story of pride, traditions, rituals. Later, we will also visit Edakkal caves and the Western Ghats. Enthral yourself with the fame of history at Edakkal caves and get drowned in the beauty of Western Ghats. 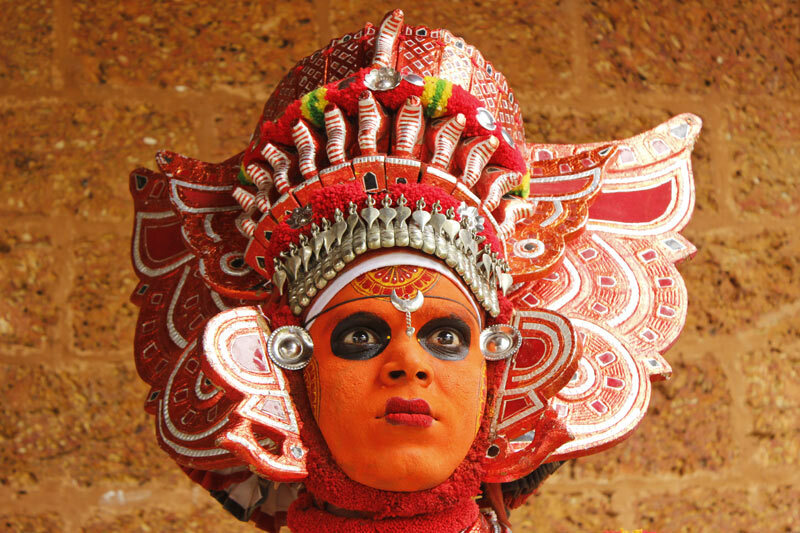 On the tenth day of the beautiful trip, we will drive to Calicut in the morning stopping on the way at Sargaalaya Crafts village to enjoy more than 800 years old temple ritual dance form – Theyyam. 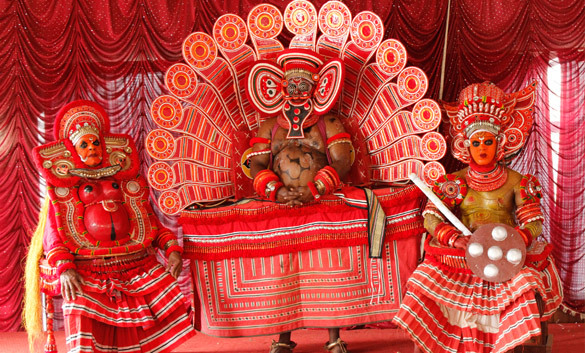 Theyyam means itself “the dance of god”. 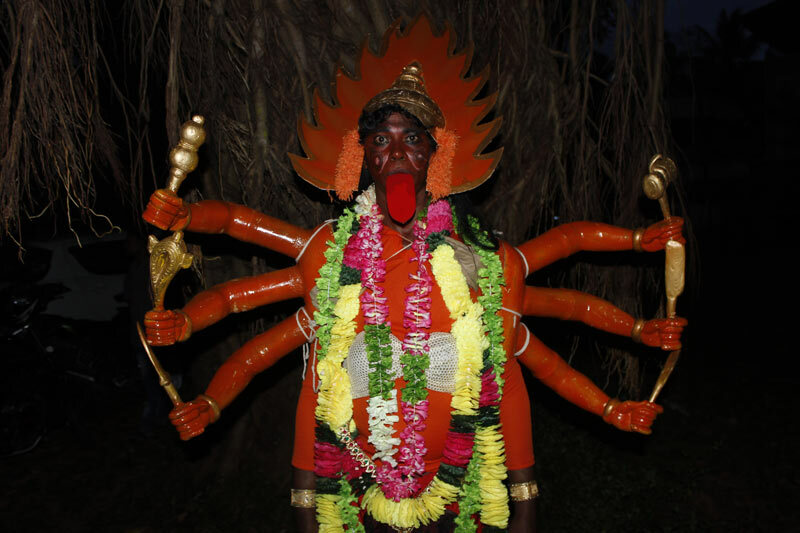 Theyyam is all about to make life thriving and recapture all perils. After enjoying Theyyam, we will go to Kalaripayattu School at Calicut to be a spectator to the ancient martial art of Kerala. Kalaripayattu considered as the mother of all the martial art forms. Kalaripayattu is a little bit a mixture of dance and defense. It is warfare with the peerless rhythmical feel that makes you forget that what you were watching is once a route to a fight. Finally reach to the resort and emjoy the hospitality of Kerala. After an awesome day at Calicut, we will drive back to Cochin today after enjoying the breakfast. Take some rest in hotel upon the arrival at Cochin. 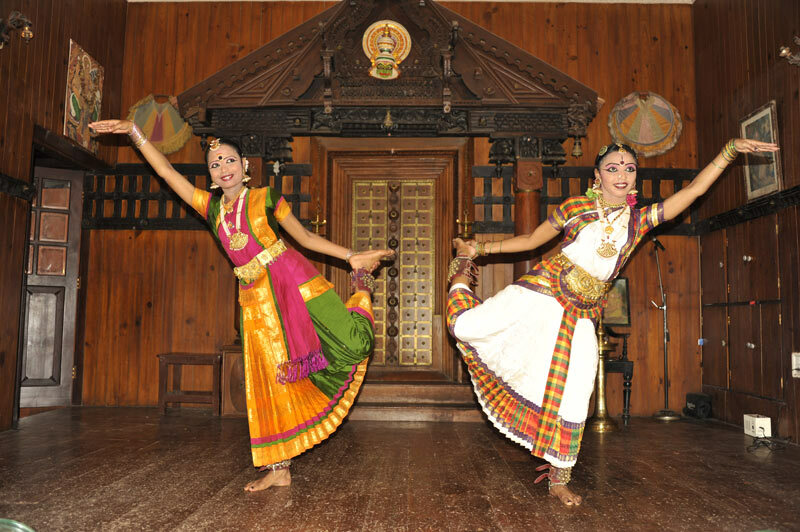 Today, we will pay a visit to one of the theaters where you will get to see the classical dances of South India. South India itself a mother of Bharatanatyam, Kuchipudi, Kathakali and Mohiniaattam classical dance forms. Classical dances are the best way to delineate stories by facial expressions and hand signs. Everything is charming in classical dance whether it’s costume, makeup, music, dance, jewellery. Dancers worship the classical dance from decades to perform on stage with the perfection. Today is the day for Thiruonam. First, we will go Vamana Moorthy temple in Trikkakkara village to see the Pooram celebration. Trikkakkara village itself has the holy importance. After being a part of Pooram celebration, we will go back to the hotel for lunch. After lunch, we will explore Kochi Fort and nearby area. In the evening, be a spectator to the preparation of Pulikali & the other folk artists. 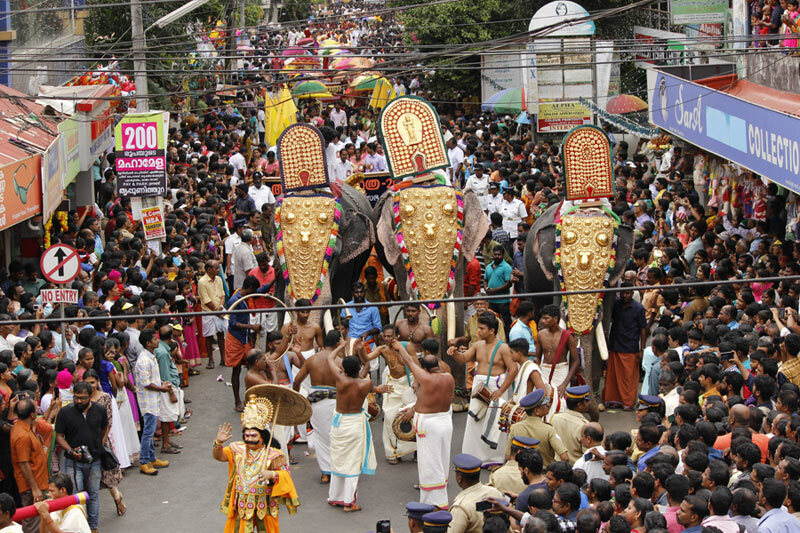 Enjoy Onam festival procession – one of the most valued harvest festivals celebrated in Kerala. After taking the breakfast, we will go through the Kochi fort. Visit Chinese fishing nets, Mattancherry Palace and Dutch cemetery. Fort Kochi’s growing cultural outline, historical landmarks, unprecedented Chinese fishing nets are confident to offer you a holistic encounter. Later, drive to Thrissur – the cultural capital of Kerala. 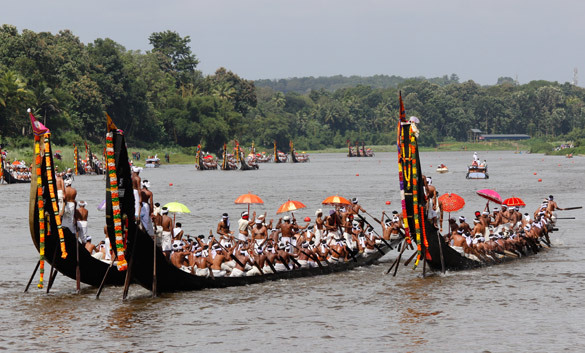 After having lunch, observe the festival procession including Kummatikali and Pulikkali in Chembookavu and Olarikkara. It will be a huge procession therefore it will include the artists as Mahabali, Krishna and other Hindu mythological figures. Today, we will visit few museums in Thrissur to spend some quality times there before lunch. Later, we will move to enjoy Kummattikali procession in Kizhkenpattukara area of the town. 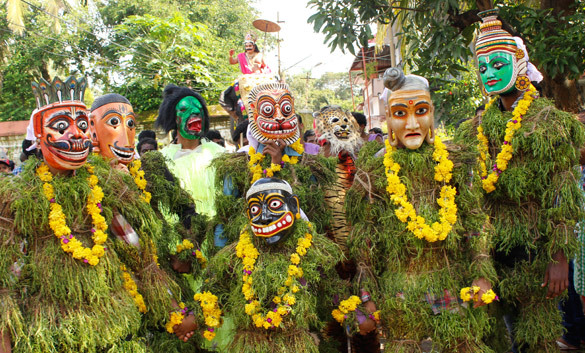 Kummattikali – the colorful mask dance is the traditional dance done to pamper the Godness where dancers wear a colorful mask and embellish dress. In the evening, we will drive to Shornur (34 KMS from Thrissur) for Tholpavakoothu Shadow Puppet Show. 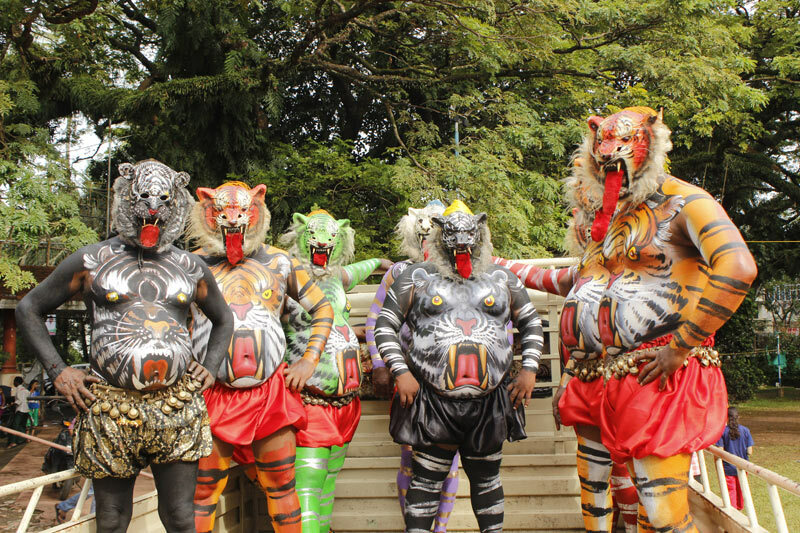 Tholpavakoothu is a unique folk art form of Kerala that represents stories in front of the viewers. The stories are mostly from the Hindu mythologies such as Ramayana. The Kerala Onam festival trip ends today. Enjoy your breakfast at Trisuur, later you will move to Cochin airport to go back to home. Waiting to see you again on another Indian trip. How will be weather during Onam Festival? August is end of the monsoon season in Kerala, however, there can still be rain hence, please bring rain coats, small umbrella and water proof shoes. Bring light sweater and jacket for hill station as the weather will be little cooler there. What else to pack for this trip? Hat, Sunglasses, Sunscreen lotion, Walking shoes, light cloths like T-shirts, short pants and International adaptor. Any suggestion for the trip? Ask your credit card/ debit card banks that you are traveling to India otherwise they might decline the payment. Always drink bottled water because normal water of India may not be suitable for you. Cover your arms and legs while entering to the temples and cover the head too. No hat is allowed for men. No leather items are allowed inside the temples. Will Photography allowed during the festival? Yes, you can photograph as much as you want. However, in Meenakshi Temple at Madurai the photography is not permitted.